The Uproar Bundle is an unique collection of 8-Stringed Loops And Multisamples For Kontakt. 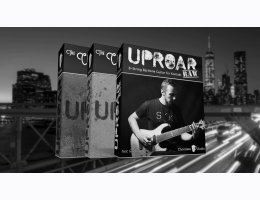 If you already own 1 or 2 products from the Uproar line, please contact Chocolate Audio through their Support for a personalized quote to upgrade to the Uproar Bundle. The Exclusive Choco-Matic Engine is included in all three of these Instrument Packs. It is not your common "play a phrase at a time" engine. Chocolate Audio built this engine making use of their expertise as sample library producers since 2003 and their knowledge as users of such phrase-based instruments. All these products also make use of their unique feature 'Sync/Legato'. Chocolate Audio have always wondered why triggering a phrase and then another doesn't simply make the first phrase flow effortlessly into the second one, rather than re-triggering the whole thing from the start in a rather un-musical way and vastly limiting the expressive possibilities offered by such phrases. So, they took care of it.